You may have heard at Angkor temple in Siem Reap, Cambodia, an elephant named Sambo dropped dead from exhaustion. She made global news after being overworked to death for tourist rides. In the end she suffered stress, shock and heart failure. (Now a petition has been set up to stop the elephant rides to the Buddhist temples). But, after just leaving Siem Reap I can tell you that yes, it is still happening. Seriously, who still thinks it is a good idea to ride elephants? Apart from the fact that she was overworked, the area is also going through a major drought. This doesn't just affect the local people and the chained elephants, but the whole ecosystem and surrounding wildlife. From an illegal trade perspective, it also leads to some ingenious poaching methods. Brought to my attention by Angkor Centre for Conservation of Biodiversity - who work with endangered birds, primates, turtles an other local species (including my favourite of course, the Sunda pangolin) - poachers are poisoning dry forest water holes, as this vital resource is so scare many creatures flock to the life giving substance only to drop dead a few yards away. With a simple short walk, poachers can easily collect their haul. "When the staff members arrived they observed two small man-made holes, one of which still contained a purple granular substance... Termite position is thought to be by far the most commonly misused for this type of illegal activity. 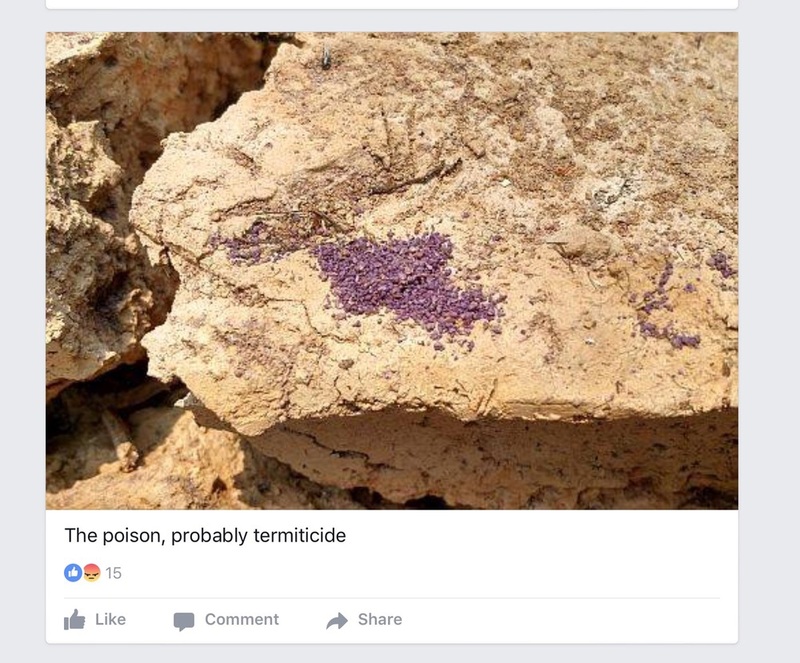 It seems the poison was being mixed with water and then birds that came to drink would immediately die of poisoning. Frogs that drank would die, subsequently poisoning further birds to be collected for cooking. 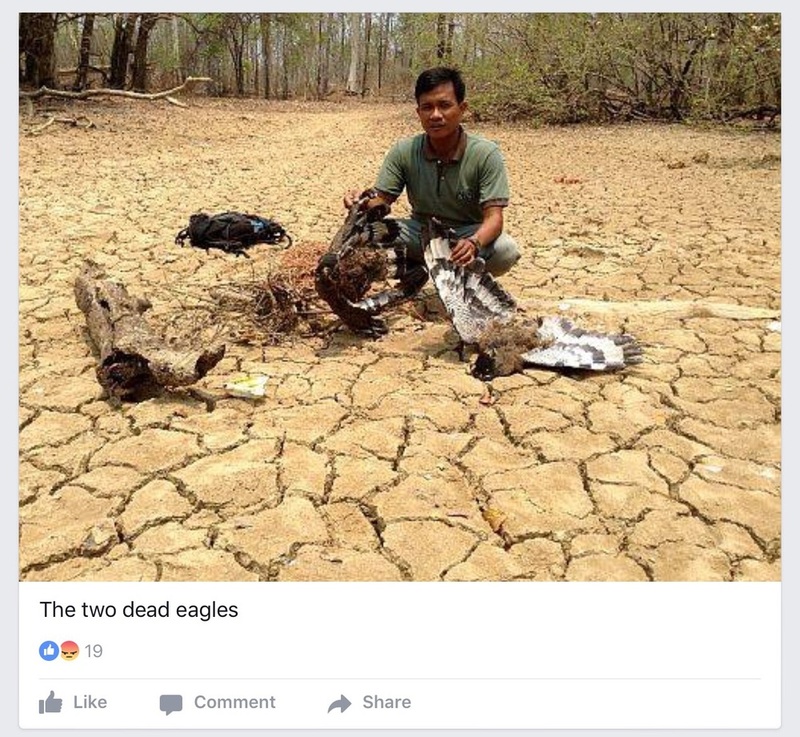 ACCB staff recovered two dead adult crested serpent Eagles (Spilornis chila) only 5m from the poison and around 15m away were dead Red-billed Blue magpies (Urocissa erythroryncha) and a Golden-fronted Leafbird (Chloropsis aurifrons)." - ACCB via Facebook. Poison (like many forest traps) is not species specific and can devistate a fragile population and pollute the ecosystem. Not only that but the birds poisoned are used for human consumption. For the local community it is incredibly dangerous to eat these illegal caught meats. As with bear poaching (also a problem in Cambodia: moon bears - for their gall bladders and bile and sun bears - for the pet trade) it is believed that the poachers were illegal loggers, opportunists looking for further ways to plunder the Earth and Cambodia's natural resources. Just another example of how all aspects of the environment are linked. By protecting water sources, the forests, soils and everything in between that can effect local communities and lead to extreme weather and climate change, we can protect wildlife and ourselves. Credit: Angkor Centre for Conservation of Biodiversity via Facebook.